What is the deal with these pink pants? Who is going to wear them? These stylish pants are seen every where now. Have you ever heard the phrase pink is the new black? Well, this is the perfect example. During this summer who wants to wear black pants anyway? And to be honest everyone is done with the typical khaki pants and we need a break from them. There are plenty of ways on making outfits for such a fun color pair of pants. The basic, solid-tone tees can be easily dressed up by pairing with a tailored jacket and the chinos. Don’t be afraid of putting on a pair of salmon (Pink) pants and just rock them. As a personal stylist, when I mention the concept of body shape and colour analysis to male clients the majority instantly assume it is something that only applies to women. Now don’t get me wrong, when it comes to the number of different female body shapes, the list is almost endless. However, like women, men can equally dress to suit their shape, skin tone, hair and even to highlight eye colour. When considering typical body shapes, men will often fall into one of five categories: trapezoid, inverted triangle, rectangle, triangle or oval. If you recognise and accept exactly what type of body shape you are, it will become much easier to identify whether an item of clothing has a positive or negative impact on your appearance – particularly if you understand the reasons why it has that impact. When this knowledge is then applied to your everyday shopping habits, it will not only improve your style and look, but will give you the confidence to know that what you are wearing is right for YOU. Those with a trapezoid body shape will have broad shoulders and chest with relatively narrow waist and hips. Due to the upper and lower body being balanced, it means this shape is far simpler to dress than others. In general, most styles and fits will suit this shape because it is well proportioned. So, if this relates to you, you can easily incorporate new trends, cuts and colours into your wardrobe, with little concern. Good news hey? Similar to a trapezoid, you will also have broad shoulders and chest, however, your hips and waist are narrower. This means your upper torso is much wider than your lower torso and, subsequently, the lower half of your body. This body shape is particularly common for those with athletic frames and can also be sculpted through regular weight lifting/body building. When dressing for this body type the imbalance between top and bottom is something you should pay special attention to. Consider detailing around the hips with the use of belts or pockets. This will help to break up an outfit whilst drawing attention to this area. Wear Breton striped tees, which are both classic in style and ideal for men of this shape – particularly if the stripes are focused across the stomach rather than on the chest. Opt for v-neck knits/tees as they will narrow the chest and draw the eye down. Use graphic prints and logos to create a central point of focus that will reduce attention to the upper chest. Try straight or more relaxed slim cuts (rather than too slim/skinny) for legwear as they will help balance your proportions and broad shoulders. Try unstructured double-breasted jackets as they will help widen the torso without adding width to the shoulders or upper chest. Try statement or on trend printed/patterned legwear in order to draw the eyeline down. Wear structured jackets with shoulder padding or wide lapels. This will only emphasise the widest area. Consider tops with wide scoop necklines. Again, this will only appear to widen that area. Wear three quarter length sleeves that will broaden the appearance of your chest. Try to stick with shorter sleeves for anything but formal shirts. Opt for skinny leg cuts as they will make the top half of your body appear even wider – throwing out your proportions further. Gravitate towards shoulder detailing/prints/colour-blocking. Pieces that incorporate such detailing will only draw the eyes to that area. Men with this body shape have shoulders that are the same width as their waist and hips. When dressing a rectangle the aim would be to widen the shoulders whilst making the lower torso appear narrower. Although you are unable to physically alter the shape, wearing certain styles and cuts can work to give the illusion of a different one. Therefore the aim with a rectangle is to ultimately appear similar to a trapezoid. Wear structured blazers and jackets that appear padded in the shoulders yet narrow down from the underarm. A good way to achieve this would be to get the sides taken in by a tailor or the jacket arm thinned. Use scarves and circular necklines to widen the upper torso. Layer intelligently – shirts and fine knitwear in particular can be used to widen the chest/shoulders and then narrow down towards the hips. Utilise prints and patterns accordingly – intelligently placed colour-blocks and prints can be effective at emphasising the upper section of your body. Wear double-breasted pieces as these will only strengthen the rectangular shape. Wear prints that mimic and emphasise your rectangular shape – for example, photographic tees or large geometric. Wear sleeveless pieces – unless layered effectively. Use bright primary block-colours on the torso unless print, detailing or an appropriate neckline is utilised. Several parts of the body are used to determine whether this shape applies to you: chest and shoulders are narrower than waist and hips, meaning you appear larger on the bottom half of your torso. This may also result in a sloping shoulder line. The imbalance is created by your lower half appearing wider than your upper body. Correcting this imbalance should be the focus when dressing this body type. It’s imperative you focus on well-fitted clothing, ill fits will only emphasise this shape. Opt for single-breasted and button-down styles as they will help streamline the torso. Wear straighter leg trousers and chinos. Give shape to the shoulders with structured tailored blazers and jackets. Aim for darker colours on top as they will instantly flatter. Introduce colour with a scarf or a bright piece layered underneath, like a tee or shirt. Wear horizontal stripes across the stomach area. 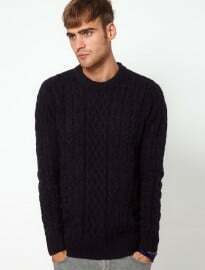 Wear polo necks or narrow crew-necks as they will decrease shoulder width and emphasise shape. Wear skinny or heavily tapered jeans/trousers as they will widen the central part of the body. Wear jackets with noticeable pockets on the front as they will attract attention to the stomach area. This shape is self-explanatory. An oval body shape appears round, particularly at the centre of the body. This may result in narrower shoulders and a slimness in the lower leg. When dressing this shape, attention should be paid to lengthening the torso, making it appear slimmer. Shoulders should be given shape too, in order to make the body shape appear more defined. This may be a shape that men find they fall into in their later years, however there are those that always fall into this category. Whatever your situation, there are ways in which you can add definition. Wear vertical stripes and pinstripes as they will instantly lengthen that specific area of the body. Ensure trouser legs and sleeves are the correct length as gathering will shorten the limbs and fail in adding shape or definition. Wear detailed prints or textured pieces in darker hues to add a point of interest to an outfit whilst remaining flattering. Aim to wear fitted, loosely tapered trousers as they will help to lengthen the legs. Wear horizontal stripes anywhere on the body as they will make that part appear rounder. Choose to wear cowl necks, wide crew necks or polo necks. Use statement/coloured belts – they will only attract attention to the waist and highlight your widest point. Wear footwear with a white sole or trim as it will widen your feet and take away from any attempts to lengthen the legs. Likewise, boots can make your legs appear shorter. Instead, try low profile, slimline silhouettes.